Electronics Costs > How Much Does an Arcade Machine Cost? How Much Does an Arcade Machine Cost? While they may seem to be out-dated, arcade machines are still collected by some people and businesses. Whether you want them for show or want to play nostalgic games such as Android, the cost of an arcade machine is going to greatly vary. Depending on the game, the condition, and the rarity of the arcade machine, the prices can be all over the place. 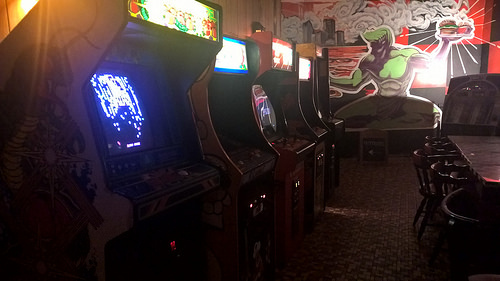 On average, arcade machines typically are going to range anywhere from $500 to $7,500. Keep in mind that these are your average machines and rare ones can easily fetch tens of thousands of dollars. If you are looking for some classic arcade games, such as Pac-man and Galaga, for example, the price will probably be $2,000 to $3,000 for a machine that is fully restored. For instance, ThePinballCompany.com has a large selection of different types of arcade machines. Here, their classic arcade machines that are restored retail for $1,700 to $2,500. A popular arcade such as Golden Tee Golf generally retails for $3,500 to $5,000 for the original machine. To this day, Golden Tee still creates an arcade game. Driving arcade games tend to be on the higher end of the price range noted above. A game such as Dirty Drivin’ can retail for $7,000 to $9,000, while NASCAR Team Racing can be near the $6,500 mark. Higher tech touchscreen arcade games can retail for $2,500 to $5,000. These newer types of arcade games will usually sit on a table top and barely take up space like the older machines. GiantBoards.com claims that you should plan on spending anywhere from $1,000 to $3,000 for a good arcade machine. This Polygon.com said the prices of a cabinet can wildly vary, but on average, it can cost about $1,000 per unit. Mario Kart, for example, can run $2,500 to $3,000, whereas Mike Tyson’s Punch-Out!! can cost $1,500. Refer to our table below to see what the popular arcade games can cost. Due to the weight restrictions of these machines, most sellers online will charge for shipping. Depending on the type of delivery that you want, the costs can be anywhere from $350 to as much as $900. Higher end shipping will include full installation and delivery while a lower end delivery will just include a drop off at the front door. Arcade games tend to have a lot of problems, particularly in the cabinet area. If you do decide to pick one up, you will have to budget future repairs. A simple technician call can cost a minimum of $100. Older arcade games, such as Pac-man and Galaga, are typically going to be fully restored. This means that all of the non-working parts are replaced, but the original box intact in tact. If the box has any cosmetic issues, it will be touched up. Arcade machines that are not touched up or fully restored and are in original working order can fetch a lot more money. Typical arcade games will feature a joystick for each player, a handful of buttons, and a coin slot near the bottom. If the arcade machine is going to be used for personal use, the coin machine part can be bypassed; if you want to have the machine accept cash, you can do so. Most games can feature up to four players. Rather than a joystick, games such as Golden Tee Golf will feature a ball that resembles a golf ball instead of a joystick and driving games will feature a steering wheel, shifter, pedals and a handful of buttons. Every game will have its own unique features. Consider other options such as MAME if you want to just play the games and don’t care about the actual machine. This is an emulator designed to recreate the arcade game system. There are many cool setups that allow you to play hundreds of games for a relatively low price. Depending on the machine that you want to buy, you may be better off purchasing it used. If you are going to buy used, try your best to see it in person to make sure that it is in working order. With so many retailers online that sell arcade machines, make sure that you research their reputation and see what previous customers are saying about them. The more homework that you do, the smoother your transaction will be. eBay has a large selection of machines you can choose from. If you want an arcade machine to put in your place of business, there are companies that will rent them to you. This way, you can break even if not make some money by charging the customer per play. This also allows you to switch games every once in a while so that you can provide other options to your customers.